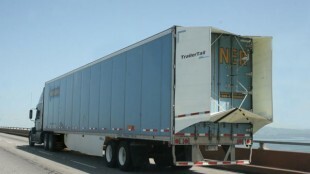 A Werner trailer with tail deployed. Illegal in Canada. 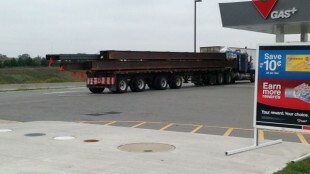 A load of steel that would take off your head in the event of a rear-ender. Legal? How hypocritical is our government? I’ll tell you in just a moment. But before I get into that, ATDynamics introduced at ATA an auto-deploy trailer tail that extends automatically from the rear of the trailer at 35 mph. It does the opposite when speeds fall below 35 mph, which helps prevent damage from backing into loading docks with the tails deployed. Speed is measured by a little radar mounted underneath the trailer. 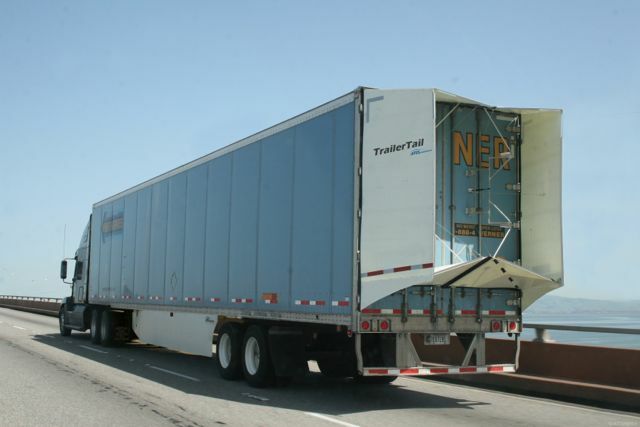 While full-length, 4-ft. trailer tails aren’t yet legal in Canada, due to moronic concerns about vehicle length, they’re proven to reduce fuel consumption significantly. About $500M in fuel per year could be saved by equipping all Canadian trailers with tails, ATDynamics CEO Andrew Smith told me during the company’s press conference. While it wasn’t being marketed as such, the new AutoDeploy feature is a great way for Canadian fleets to get away with running the devices in Canada. I’ve seen TransWest trailers pulling into the Thickson MTO weigh station with tails deployed and wondered whether or not they’d be fined. Now, with AutoDeploy, those tails would discretely tuck back in as the truck decelerates to enter the weigh station. Ha! Anyways, getting back to why our government is hypocritical. They continue to preach environmental sustainability, yet here is a system that’s proven to save significant fuel, lessen our reliance on fossil fuels and all that jazz, yet the government continues to prohibit their use due to concerns about rear-end collisions involving trucks with tails. Have you ever seen these things demonstrated? You can fold them in with one hand. One hand! Let me once again submit evidence to you of our government’s hypocrisy. Picture A to the right is of a set of trailer tails, which, again, can be folded in with one hand. 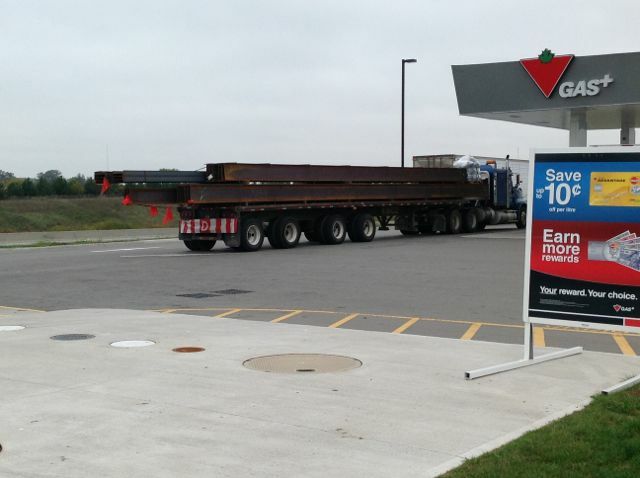 Picture B is a perfectly legal load of steel, overhanging the end of a flatbed trailer, at face level, with no more protection than a red piece of fabric attached. You couldn’t make this up. Just think if you could configure the unit with progrmmable GPS units then Canadian Carriers could deploy them when they are running in the United States.